it adds an elegant, luxurious aesthetic to most bathrooms. Many may find the look of a bathtub made of copper to be more sophisticated than bathtubs made from other, more common materials. It can also add a feeling of warmth to many bathrooms because of its color. Overall, copper creates a unique style because it is so rarely used. Another major benefit of a copper bathtub is its durability. Copper is naturally resistant to the dents and scratches that other materials are subject to. An interesting fact about copper is that if does happen to get scratched, the scratches will actually disappear over time on their own accord. This is because copper gradually changes color, which results in a slightly green tint after several years of use. Lack of maintenance is another benefit that a copper bathtub offers. Unlike other materials, copper doesn’t require any special attention to stay in good shape. Most bathtubs require sanitizing and chemical cleaners to keep them clean from mold and bacteria. Other materials can also build up soap scum residue over time, which results in a dirty appearance. Simply wiping the periodically with a dry towel is usually sufficient to keep it clean as the material is resistant to mold and bacteria. The biggest downside to a copper bathtub for most people is its cost. Copper is simply one of the most expensive materials to use. Also, properly constructing a bathtub from copper usually requires expert craftsmanship. The combination of these two factors is the main reason for the high price. The other main drawback is that a copper bathtub is usually difficult to find. Most retail home improvement stores don’t normally carry copper bathtubs. This means that an individual has to make a specialty order from specific manufacturers, which inevitably results in limited options. In most cases, purchasing has to be done online, which also means that shipping and handling must be arranged for and paid. 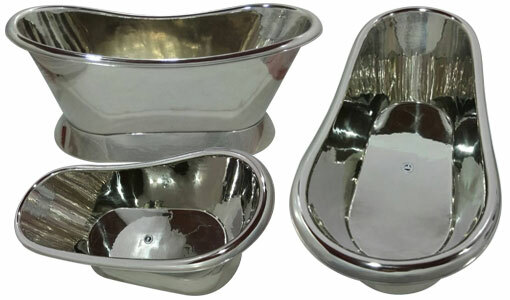 Hammered Clawfoot Copper Double Slipper Tub This clawfoot copper bathtub is made of 16 gauge pure durable copper sheet. The bathtub has an antique copper finish and has hammered surface on the interior & exterior which adds a unique definition to the look of this copper tub. The tub has a clawfoot design feet that in addition to the aesthetics also helps in stability and keeping the tub higher from the ground allowing you space between tub and ground which makes it easier to wipe off the ground during cleaning in your bathrooms or rooms wherever you install this tub. The tub can be provided to you with faucet holes dug on the rim of the tub or without if you wish to have wall mount faucet instead. The Drain hole is located at the center. Smooth Double Slipper Copper Bathtub This double slipper copper bathtub is a freestanding copper bathtub with the smooth antique copper finish on the inside & outside. 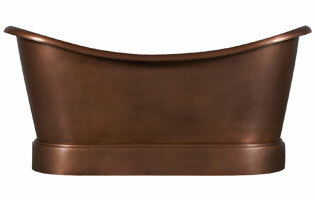 Made of 16 gauge pure durable copper sheet this bathtub is surely going to enhance & uplift the decor of your bathroom. The bathtub is spacious enough to accommodate two people hence the name Double Slipper. Copper Bathtub Agna is double slipper copper bathtub with slanting pedestal design. This copper tub has an electroplated nickel finish on the interior & on the exterior. This copper tub has following dimensions: 1680mm x 725mm x 715mm. This copper tub is ideal for those who like the properties of copper like its durable nature, temperature retention, and antibacterial properties but would want a shiny nickel finish on it. Get home this beautiful slick shiny bathtub and enjoy your baths every day. Copper Bathtub Kara is a dual metal finish copper bathtub. Made of 16 gauge pure copper sheet this copper tub comes in Nickel finish on the interior and on the slanting pedestal, while the exterior body is a shiny copper finish. This copper tub has following dimensions: 1680mm x 725mm x 715mm. This bathtub is very popular in UK market. 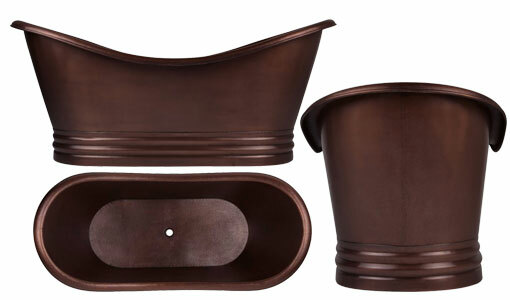 Hammered Dark Copper Double Slipper Tub comes in the dark antique copper finish. A decorative plinth encases the base of the tub, while the lip contains a continuous rolled rim. Forged by hand, this tub adds a warm and rustic look to any bathroom. Pair with an elegant freestanding tub faucet to complete the look. 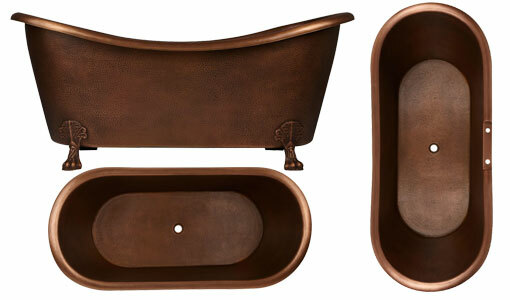 Made of 16 gauge pure durable copper sheet, this copper tub is a must have for your luxurious bathroom. This copper tub has a special place in our inventory of copper bathtubs and in our heart. Copper Bathtub Aspasia is a copper slipper tub with slanting pedestal design. This copper tub comes in the shiny copper finish on the interior and on the exterior. Like all our copper bathtubs this copper tub is made of 16 gauge pure durable copper sheet. This copper tub has the dimension of 1680mm x 725mm x 715mm. I am using copper bath tub Agna because of its Nickel finish it illuminated the place and I like the fact that scratches disappear over time so I don’t have to maintain it actually.Thanks a lot coppersmithcreations for such lovely products, it’s worth my money.. Thank you for your generous feedback. The copper bathtub is a classic fixture in art, literature, and the lives of the rich and famous. From the great Impressionist artists and hot list writers to the nobility and aristocracy of eras past, it has been and continues to be an icon. Coppersmith Creations copper tub is a piece of art and point of attraction of our home. Craftsmanship in Copper tub from them is unique and unmatched. Copper Tubs from them are reasonably priced and best in looks and quality. I have seen coppersmith creations copper bathtub in one of my friends bathroom which was tastefully decorated with beautiful furniture and the bathroom was amazing with an enormous copper tub from Coppersmith Creations. These copper bathtubs enhance the beauty of bathroom manifolds. I am also planning to buy one copper bathtub from them. With innovative ideas and creative designs Coppersmith has given a new facet to the concept of modern bathroom design. Much beyond its health benefits, the copper fixtures produced by Coppersmith distinctly differentiate the bathroom from any other contemporary bathroom with standard fixtures. Each fixture is a piece of art that is created specially for a client. This blog entry is truly informative and gives an immense insight on each item produced by Coppersmith.